The murder of high-ranking judge, who upheld the controversial ban on headscarves, and Prime Minister Recep Tayyip Erdoğan and his party’s radical rhetoric that incited the incident places Turkey on the brink of another political upheaval. If political and grassroots pressure fails to unseat the misguided prime minister, the military, which sees itself as the guardian of the country’s secular nature, could be forced to intervene again. Alpaslan Aslan, 29, burst into the chambers of the Council of State, Turkey’s highest administrative court, on Wednesday and gunned down five judges. Judge Mustafa Yücel Özbilgin died after several hours in surgery. The rest survived. Before opening fire, Mr. Aslan reportedly blamed the justices for their February ruling that upheld the ban on headscarf, a religious attire, from universities and other public buildings. On Thursday, an estimated 25,000 protestors gathered at the Council of State building in Ankara, chanting secularist slogans and calling on Mr. Erdoğan’s Justice and Development Party (Adalet ve Kalkinma Partisi [AKP]) to resign. 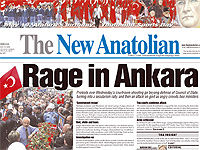 The Turkish Daily News [TDN], the government-backed English daily, said some protestors were chanting “Down with Shariah” and “Mullahs, go to Iran,” while waving the national flag. Sumru Cortoğlu, chief justice of the Council of State, accused Mr. Erdoğan’s administration for the murder, saying “careless remarks by government officials” resulted in the shooting rampage. Mr. Erdoğan’s quest for an Islamist country appeared during his days as mayor of İstanbul and a leading member of the Islamist Welfare Party (Refah Partisi), which was led by Necmettin Erbakan and banned in 1997 for undermining the secular nature of the country. He and others then set up another Islamist group and called it the Virtue Party (Fazilet Partisi), which was banned in 1999. He became Turkish prime minister in March 2003. Mr. Edroğan was conspicuously absent from Judge Özbilgin’s funeral yesterday, while high-ranking military leaders were very visible at the funeral and other government ceremonies, The New Anatolian, and independent daily, reported. “I condemn once more this heinous attack which targets the secular republic. Anyone who has caused the attack should reassess his attitude and behavior,” President Ahmet Necdet Sezer, former chief justice of the Constitutional Court that banned Mr. Erdoğan’s Islamist parties, was quoted by the Anatolian as saying. Mr. Erdoğan’s policies and public statements have energized the religious ultra-nationalists who have attacked young girls for wearing short skirts. While Turkey is overwhelmingly Muslim, its dress code and trends are European. Turkey’s secularism has been enshrined by Kemal Mustafa Atatürk, who founded the modern Republic, in the constitution. And the military has never shied away from guaranteeing a secular republic by force, if necessary. Columnist Mete Belovacikli warns Mr. Erdoğan and his party to heed former President Süleyman Demirel’s caution that the military may not sit idly to watch the A.K.P. radicalize or diminish the country’s secularist nature. Meanwhile, former Turkish Prime Minister Bülent Ecevit was in a coma after suffering a massive stroke. He was the leader of the Democratic Left Party and oversaw the capture of Kurdistan Workers’ Party [PKK] leader Abdullah Ocalan. In 1974 he ordered Turkish troops to northern Cyprus after Greek Cypriots launched a coup to unit with Greece. Mr. Ecevit was born in 1925 in what was then Constantinople. Erdogan was not the leader of Refah, but rather one of the top deputies (he did not serve in parliament but was elected the mayor of Istanbul) – the leader of Refah was the more (publicly) radical Erbakan who now hads an offshoot of Refah that is decidely more (publicly) radical than the other offshoot, AKP. AKP maintains that they are a moderate islamic party that only seek increased religious freedom, but many believe that they desire to use EU reforms as the basis to weaken the military so that eventually they can overthrow the secular state. Thanks for your comments and corrections. That was a glaring oversight. How could one forget Necmettin Erbakan… I will make the corrections.